If you dream of making it big in the IT security community, the CISSP certification is a necessary milestone. Certified Information Systems Security Professional (CISSP) is a globally recognised certification in the field of information security, which has become a gold standard of achievement that is acknowledged worldwide. CISSP certification deals with a range of information security topics including security engineering and software development security and helps you understand the various areas of security you should be aware of. The CISSP exam is highly challenging and requires a broad level of knowledge. However, achieving the CISSP certification requires help, irrespective of your experience level. There are a wide number of courses and training programs in the market, but make sure you sign up for one that equips you with the best practices in the industry and helps you to ace the exam in your first attempt. To help you choose the best CISSP course, THN Deals Store presents Certified Information Systems Security Professional Training Course which walks you through the skills and concepts you need to master CISSP. 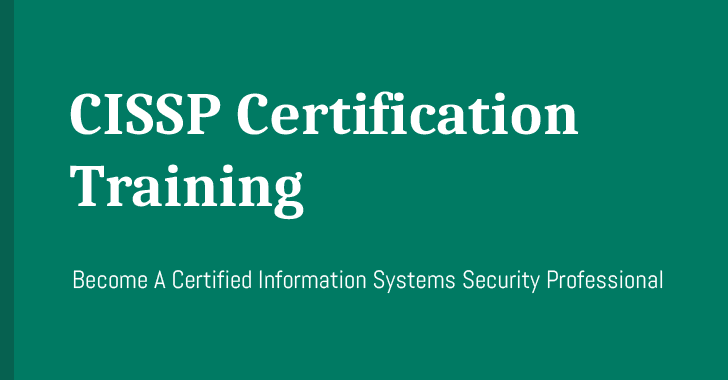 Besides learning the skills you need to pass the CISSP exam, this Certified Information Systems Security Professional Training course helps you master the fundamentals of information systems security. You can get this "Certified Information Systems Security Professional Training" course for just $39 (94% discount) at the THN Deals Store. Certified Information Systems Security Professional Training contains eight comprehensive modules with lifetime access that will help you learn the principles of access control and how they can be strengthened and applied to keep unauthorised users out of a system. The course makes you understand the role of information governance and risk management in security standards, the use of cryptography to protect data in transit, build security architecture and design to limit data access and potential angles of attack, and discover the legal obligations of data security. This CISSP Training course is comprehensively designed in-line with the International Information Systems Security Certification Consortium (ISC)², which governs this certification. So, if you are interested in technology and looking to build a strong career in Information Security, this Certified Information Systems Security Professional Training course is for you. Computer Hacker Professional Certification Package — Offers all the material and training you require to help pass CISSP, CISM, CISA, Ethical Hacker and Forensics Investigator Certification Exams to become certified penetration tester. Wi-Fi Hacking and Penetration Testing Training Course — This training course, which costs just $25, is available with lifetime access and focuses on the practical side of Wi-Fi hacking without neglecting the theory behind each attack. All the attacks explained in this course are practical attacks launched against real Wi-Fi networks. Python For Offensive PenTest: A Complete Practical Course — Offers 6 hours of online Python training helping you with the concepts and techniques to create your own tools from scratch, rather relying on ready-made tools.